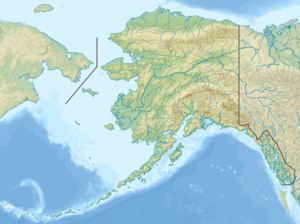 Niukluk River is a waterway in the U.S. state of Alaska. It rises in the Bendeleben Mountains and, after flowing across a broad valley lowland for about 15 miles (24 km), enters a narrower valley, in which it flows for about 20 miles (32 km). Below the mouth of Melsing Creek, the valley broadens out and merges with that of Fish River, to which the Niukluk is tributary. It receives many tributaries, of which the Koksuktapaga, joining it from the south, is the largest. In Niukluk River itself, gold was found at its head, though most abundant below the mouth of American Creek. Just below the mouth of Ophir Creek, a little gold has been rocked out on the bars. The broad gravel flood plain in this part of the basin is said to be auriferous. Below the mouth of Ophir Creek the river has cut a small rock canyon 50 feet (15 m) below an old valley floor, leaving broad benches on either side. These benches are sheeted over by a few feet of gravel. ^ a b "Niukluk River". Geographic Names Information System. United States Geological Survey. January 1, 2000. Retrieved September 23, 2013. ^ Orth, Donald J.; United States Geological Survey (1971) . Dictionary of Alaska Place Names: Geological Survey Professional Paper 567 (PDF). University of Alaska Fairbanks. United States Government Printing Office. pp. 691–92. Archived from the original (PDF) on October 17, 2013. Retrieved September 22, 2013. ^ Geological Survey (U.S.); Brooks, Alfred Hulse; Collier, Arthur James; Walter Curran Mendenhall; George Burr Richardson (1901). Reconnaissances in the Cape Nome and Norton Bay regions, Alaska, in 1900 (Public domain ed.). Govt. Print. Off. pp. 106–. Retrieved 23 March 2013. This article related to a river in Alaska is a stub. You can help Wikipedia by expanding it. This page was last edited on 19 November 2018, at 04:30 (UTC).